Tulips became popular from the moment they were brought to the Holland. During the period called "tulip mania", single tulip had the price equal to annual salary of a craftsman. Tulips can be divided into about 150 various species, but there are more than 3,000 naturally occurring and genetically cultivated varieties of the flower worldwide. Tulips have between 2 and 6 leaves. Some species have up to 12 leaves. Leaves are strap-shapes and covered with wax. They are spirally arranged on the stem. Name "tulip" originates from Turkish language, where this plant represents national flower. Tulip in Turkish means "turbin" because this flower has the similar shape like unique-looking Turkish hat. Tulip do not live long period of time, but they can continue growing even after removing the flower from the ground. Tulip in the vase can grow one inch in length. were brought from Turkey to the Holland. Certain varieties of tulips got their names by the unique scents. Apricot Beauty is a sort of tulip which smells like apricot. Tulips have a wide variety of meanings, with each color symbolizing something different. In general, tulips are said to symbolize love and signal spring’s arrival. 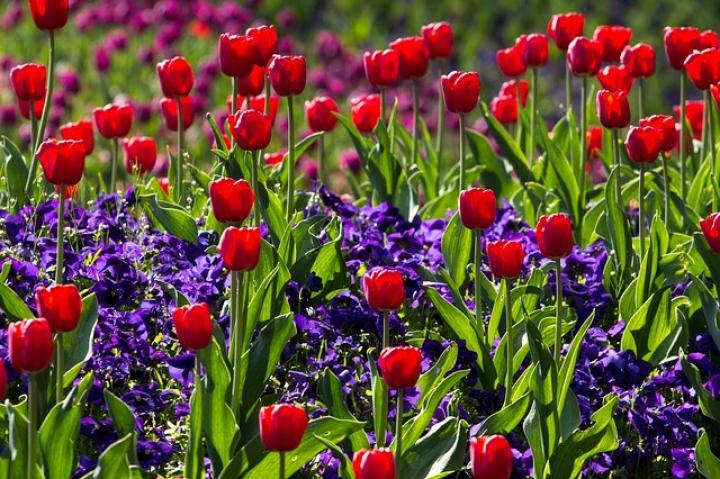 Red tulips represent true love, white tulips say “I’m sorry,” and purple tulips symbolize royalty. Tulips are affected by fungal, bacterial and viral diseases. Rabbits, gophers and squirrels like to eat tulips. colors although there are no pure blue varieties. The tulips are in third place in the row of most popular flowers. Tulips produce tuliposides and tulipalins, chemical substances that induce allergy. Color of tulips depends on the variety. Most tulips have flowers in different shades of yellow, orange, pink, red and violet. Certain varieties have flowers made of combination of several colors. On Valentines day the tulip is the second most popular flower to send (after the roses). Consumption of tulips can induce poisoning of horses, cats and dogs due to substances called tulipalin A and B. Flower is shaped like a cup and it consists of 3 petals and 3 sepals. Since petals and sepals look alike, they are both known under the common name "tepals". Most species of tulips can reach between 2.7 to 4 inches in height. Tulips can have one or more flowers on the stem. 3 billion bulbs each year. Tulips do not have long lifespan. They usually live from 3 to 7 days. The beautiful flowers are actually related to another popular spring flower: the lily. Even though certain parts of tulips are toxic, petals have been used as food during the Second World War. Like many other flowers, tulips are edible! Tulips still grow after they are cut and they continue to bloom 3 to 7 days in a vase.